384 pages | 30 B/W Illus. Over the last two decades Outdoor Studies has emerged as an innovative and vibrant field of study. This is the first book to offer a comprehensive appraisal of established and cutting-edge research methods as applied to Outdoor Studies. Covering qualitative, quantitative and mixed methods, the book examines key methodologies, themes and technologies such as digital research, mobile methodologies, ethnography, interviews, research design, research ethics and ways of disseminating research. 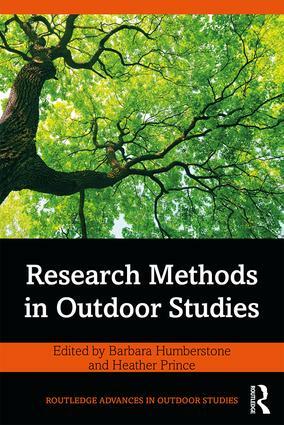 Featuring contributions from leading researchers from a variety of disciplinary backgrounds, this is an essential text for any Outdoor Studies course or for researchers looking for innovative and creative research techniques. 1. Entangled philosophical and methodological dimensions of research in outdoor studies? Living with(in) messy theorisation. Barbara Humberstone is Professor of Sociology of Sport and Outdoor Education at Buckinghamshire New University, UK, and Visiting Professor at Plymouth Marjon University, UK. She is also Editor-in- chief of the Journal of Adventure Education and Outdoor Learning. Her research interests include: Embodiment, alternative/nature based physical activities and life-long learning, wellbeing and outdoor pedagogies, and social and environmental justice. Heather Prince is Associate Professor of Outdoor and Environmental Education and Principal Lecturer in Collaborative and Experiential Learning at the University of Cumbria, UK. She is interested in pedagogic practice, including the design of higher education courses and support for research programmes, students and staff. Her research interests are in school-based outdoor learning, sustainability and adventure. She is Associate Editor of the Journal of Adventure Education and Outdoor Learning and Principal Fellow of the Higher Education Academy, UK.